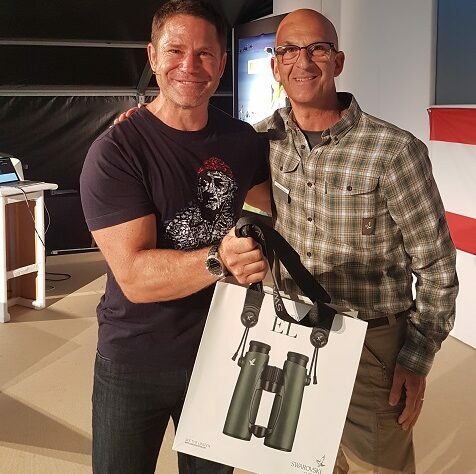 World Land Trust (WLT) corporate supporter Swarovski Optik presented WLT Patron Steve Backshall with a pair of Swarovski binoculars on stage at the British Birdwatching Fair. The gift was in recognition of the efforts Steve and his wife Helen had gone to supporting WLT’s appeal to purchase and protect rainforest in Borneo earlier in the year. After weeks of hard-core training and tireless fundraising, Steve Backshall and Helen Glover completed the Devizes to Westminster International Canoe Race (DW) in 22 hours and 48 minutes, winning the mixed team category, over the Easter weekend. Their efforts helped WLT to triple the original fundraising target for the Saving Kinabatangan Appeal and protect five properties in the Kinabatangan area. Peter Antoniou, UK Country Manager for Swarovski Optik, presented Steve with the binoculars on stage after his presentation about shark conservation. Backstage Peter and Steve jointly presented Germanico Barrios Blandon, Ecotourism and Marketing Manager of FUNDAECO, WLT’s partner in Guatemala who was presenting at the Birdfair, with a pair of binoculars as well. But it was not just Steve and Germanico who were gifted a pair of binoculars from Swarovski. Every year WLT holds a competition at the stand to win a pair of binoculars, and entrants this year had to answer the question 'How many Blue-throated Macaws are estimated to be left in the wild?' (the answer: less than 250). 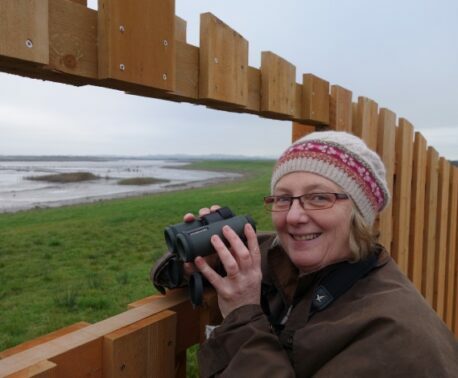 Valerie Lum from Buckinghamshire won this year, saying "I was very surprised to win these Swarovski Optik binoculars. I am absolutely delighted with them – the image is so clear and they are so easy to focus, even at close range. 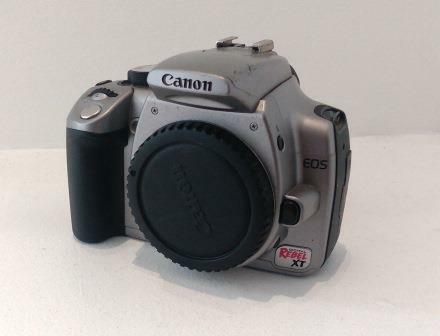 I will certainly get a lot of use out of them, especially for bird watching."